Logbook entry. Logbook 9, Day of the final operation. First entry. This is my ninth logbook. And I am called The Captain. For now, this is the only thing you need to know about me. I am writing this, because I might not be able to write it down after this day. I don’t know if we succeed. If, then I will continue writing. If not, well, then hopefully one day somebody will find this note and understand the true meaning of the uprising on the 12th of December, 2032. What I am trying to say: I might die today. The whole Pirates of Justice might die. Who are the Pirates of Justice you might wonder. We are a group of normal people. Within our group, nobody cares where you come from and there is equality within our group. Everybody has the right to speak and bring in his or her own ideas. Also we are divided into different groups. We have Planners. Executers. Providers. Preparers. Group Leaders. Trainers. And Experts, operating alone in their special field, without risking another life. We come from different cities, continents and even planets. There are two things that bind us together. We all survived the Meteorian Rain! And we want to free the world! The government calls us “Terrorists“ or “Invaders”. But all we want is justice and to bring the old buccaneer laws in this territory. That is why we are the Pirates of Justice. You probably do not remember the Meteorian Rain because you were not born then and the government tries to cover it up. In 2018, an unexpected rain of meteorites came down on Earth. It hit every continent, but here in central Europe, not everything was destroyed. Only the tinier meteorites came down and especially here the people could hide in the former underground coal mines. In the rest of Germany, most cities were destroyed. Berlin, Hamburg, München, Köln, they all burned down to ashes. That is why the former “Ruhrgebiet” is now the center of governance. Dortmund, the capital, was only hit by a few meteorites. Most came down in the outer regions and a few bigger ones in the area of the shopping streets, missing the central station. Of course, the Underground trails as well as many streets were totally destroyed. Where the meteorites hit, buildings became ruins and streets turned into hardly narrow passages. The air was very dusty for months and many surviving people died in the end due to coughing. You could sometimes not even see other people when they stood in front of you. After a while, the dust settled and the survivors searched the ruins for usable stuff, but left them as they were. Until now, nature has won over many of the ruined buildings and streets. Flowers and trees are blossoming in the broken houses, even some plants with purple leaves which were brought by the meteorites. Same as the nature, humans also tried to cope with the new situation. They gathered in groups and built communities. Unfortunately there were also some extremist survivor groups who seized the power over the other communities in violent fights. After several years, in 2024, the members of the United Patriots won over and erected their fascistic system on the ruins of the former city Dortmund, Bochum and Essen. 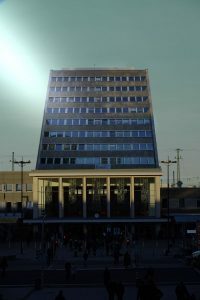 The central station of Dortmund was expanded and is now their headquarter. They reestablished coal mining and brought electricity back to the world. The negative side effect of their system is their fascist attitude. Shortly after the reorganizing of electricity supply, the old stadium was brought back to life, since it was hardly damaged. It is now the Signal Iduna Arena and every revolutionist or freethinker from the whole Reich has to face his or her nightmare there. They come up with new methods of brutalizing and humiliating our fighters if kidnapped. Torturing machines, wild animals and publicly distributed stones for stonings are a few examples of the cruelties going on in the arena. Only Germans are allowed in the Ruhr area and they want to expand. Regularly blood checks shall determine if somebody is German enough or has to enter the Arena. Of course the outer world does not know this. They only know that the Ruhr Governed Reich provides shelter for every refugee who survived the Meteorian Rain. Everywhere people from the government are telling lies so that the people come to the Reich only to dispose every non-German and create a race of German humans only… But this will end today! We are prepared as never before. Today we will tear down the Signal Iduna Arena once and for all. The symbol of the Ruhr Governed Reich will collapse as will their oppression! Today is the day of the happening. It will be known as the great day of victory! Nothing could possibly go wrong since we have two backup plans for every disaster which we can foresee. The plan is the following: It will all start in the Arena. We have fighters who were captured on purpose. They and our innocent looking spectators will charge the assault while our technician experts will shut down the electric and the machine guns on top of the Signal Iduna Arena. Then the tanks we have imported over the last year will tear the walls down for the visitors to leave. Self made bombs will then begin to explode. At the same time, our Executers will invade the central station from the Underground. It took us several years, but we managed to fix the trails between the forbidden zone and the former Central Station without their knowing. Good that the government does not know that we are the lords of the KaReiSta-Zone, the triangle between Kampstraße, Reinoldikirche and Stadtgarten. Officially the tiny meteorites which hit the area segregate poisonous gas. Hell if they knew. Our good friends who travelled with the meteorites helped us understand that the body can get used to the gas if only trained for a few weeks. It works like a medicine where you have to increase the dose every few days. In general our friends from the universe are very helpful. They are the last of their species, blue skinned and the very opposite of humans. Ok, they also breathe oxygen, but they do not produce carbon-dioxide but only store the oxygen in their bodies during daytime and release it while sleeping. They are tinier than us, so we call them Smurfs. I do not remember who came up with that idea but everybody likes it. So the Smurfs helped us a lot in dealing with the different resources and gases the meteorite stones have in store for us. That way we were able to even expand our territory due to that seemingly unhealthy gas. Today the government will also understand the true power of Yelinium, a metal with a lot of fire potential we extracted from meteorites. We will invade every governmental site with Yellinium bombs in Dortmund. After this day, the clearing of the districts of Central Town, Greater Hombruch, The Northtown, Great Airstation Region and East-Town District will begin. In a week we should be the rulers of Dortmund and will begin the Expansion in Bochum. By then the heads of the government should be done and we only have to get rid of the remaining fascists. Then we can built up a region of real freedom and a helpful people. As we realized, the humans can only survive if governed by open-minded people. Everybody who reads this is encouraged to pick up the fight if we failed today. It is seven o’clock in the morning of the 12th of December in the year 2032 and I am finishing this logbook entry. I am The Captain. And I have to do my duty. My crew awaits a flaming speech of their founding father. This day we write history. Dortmund will never be the same again. Never. When I come back today, I will finish this narration with the events of today. If not, the Pirates of Justice are no longer. My project focuses on the city of Dortmund. The short story portrays a dystopian version of the city and some problems of the inhabitants. This idea developed over some time. The first idea was to write a story about the soccer club, but was shortly afterwards dispatched due to a lack of information and interest in that specific topic. 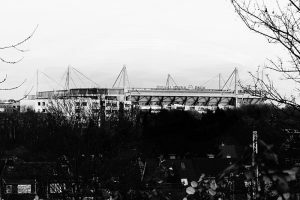 Nonetheless I felt that the stadium should be part of the project, as I can see it every day on my way home from university and it is a big symbol for Dortmund. Then I came up with the idea, that it could be a symbol of power, but did not know whose symbol that should be. I figured out that it can be used in the same way as the colosseum of Rome. In that result, the government displays the evilness. Of course an opponent for the villainous government needed to be found and the idea of a resistance group occurred. As the members think very heroic of themselves, the group needed a strong name. “Pirates” seemed to be very accurate. Of course Dortmund is far from the sea, but since the city was a former “Hansestadt”, it is quite possible that inhabitants who are historically interested, use the name “Pirates”. 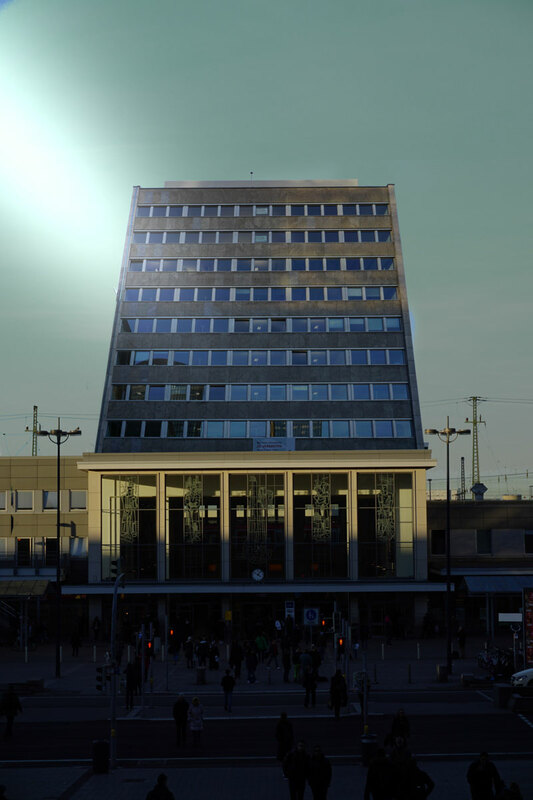 When I read the text about dystopias for the seminar, the image of Dortmund began to darken and the focus of the story turned out to be on the resistance group. 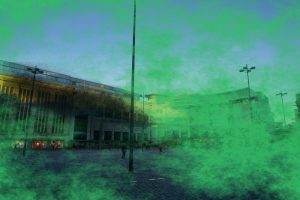 To be more creative, I took some pictures of Dortmund and used imagined filters in my head to make it look like it was destroyed. That was not enough so I photoshopped the pictures to a darker level. The result was a scary town and that built the basis of the story. The interesting thing about the story is the way it is presented. For the better understanding of the events that took place before the story, a fictional narrator seemed more plausible than an omniscient third person narrator. The method of the logbook entry was used because it is the basis for an open ending. The reader does not know whether the logbook entry was written in recent time or if somebody found it a few years later. It can be interpreted in both ways. A problem during the project was the editing of the pictures. The image editing program did not work as planned and portraying a destroyed city was not easily possible. Therefore dark colors were used to portray a world of darkness and therein the undistorted buildings of the town. The whole project aims to portray the city Dortmund in a rather unusual way. In that world, the soccer club’s heritage is used as a symbol of oppression and the central station has turned into the government seat, which is very ironic since the trains normally portray an attitude of freedom and are reversed in this case.